Â You reach a nationwide (or international if willing to take the extra steps to ship international) buyer audience. All money transactions are handled through Paypal, so people can pay in several forms (transfer, credit card, e-check). No meeting up with strangers in parking lots to sell goods. Whether auction or “buy it now” you can get the price you want. No hauling tack to sales. There is some issues with non-paying buyers, which mean you have to re-list the auction. Shipping is an extra cost and hassle, but buyers on Ebay are accustomed to paying shipping. Also, if it can ship USPS Priority Mail, the boxes are free, and labels can be printed at home. You must thoroughly and accurately describe your listing, so buyers are not disappointed when it arrives. The first step is to take good pictures of your wares. You do not need a fancy light box, but a white sheet laid over a chair or boxes can give you a neutral background.Â It pays to study your camera manual a bit at this point. Usually, the best option for pictures is taking them outdoors (without flash). However, if that is not an option then find the location with the most light. Then turn off the flash of your camera and bump up the ISO, so your pictures will remain sharp. A decent mid range compromise. 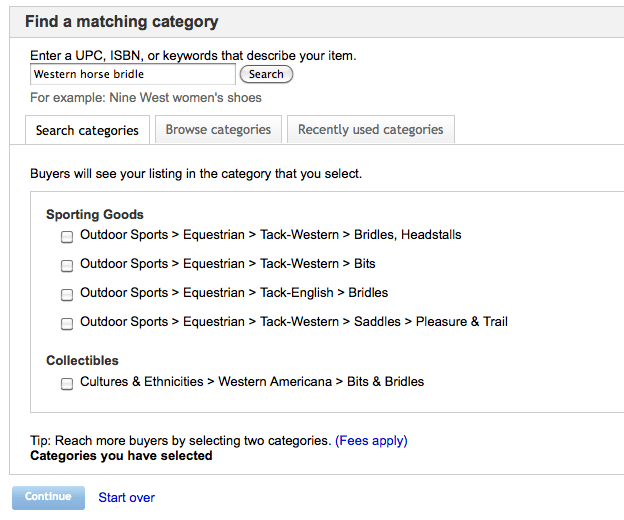 Next, Ebay wants you to describe your item so it can look up the category. Since we are interested in selling horse tack, the most suitable catagory will be under Sporting Goods>Outdoor Sports>Equestrian. From there, you can choose from a variety of categories where your item will be most appropriate. 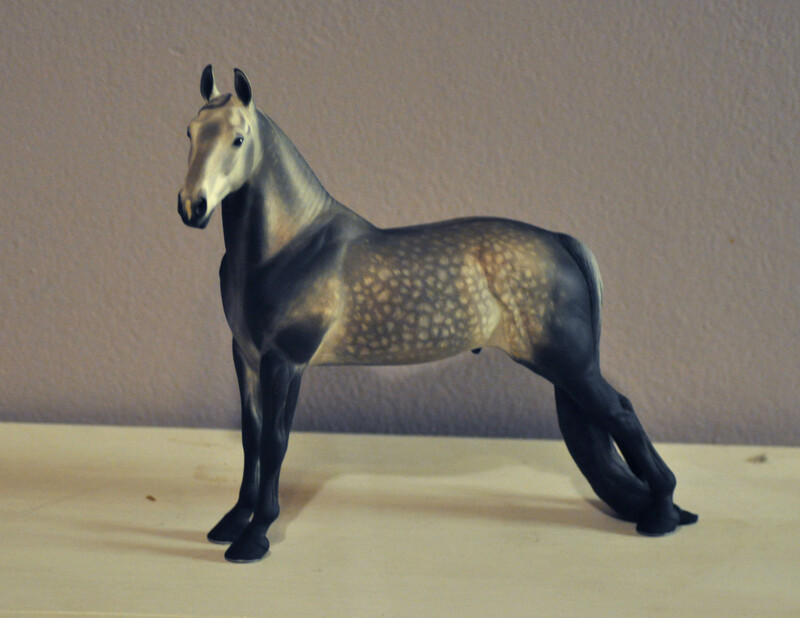 If you have a collectable horse item or an antique, you might consider adding an additional category (usually for an additional fee) under Collectibles. So I entered “western horse bridle” and it gave me a list of appropriate categories to choose from. I then click on the top one and click continue. 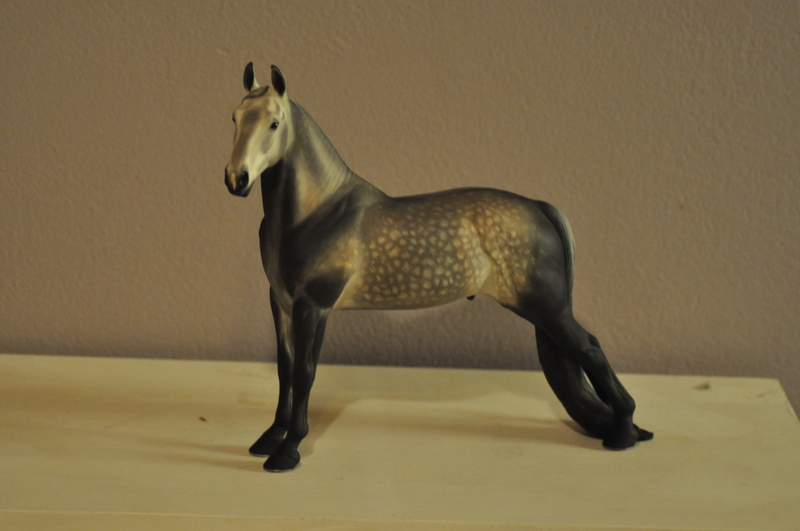 If the bridle I am listing is an antique, you can see I have the option to click a category under collectibles also. The next screen is where you will describe your auction. Anything with a green star is required. Make your title descriptive, with words that people will search. People search by descriptive terms like size, color, condition etc. Words like WOW, LOOK, or PRETTY are not usually searched for. Make your description thorough, but buyers do not necessarily need your life story. If you are selling something used, it might be beneficial to say why. Something like “need a bigger size” or “changing disciplines” is much more appropriate than a sob story, and usually will gain more trust from the buyer than too much drama. Mention size, color, brand, condition, blemishes, repairs, problems and anything else that you yourself might want to know if you were buying the same item. Some people put their shipping and return policies here. However, Ebay gives you those option further down the page, and will be posted on your auction anyways. I do not believe the average seller needs to offer returns, especially on used items. 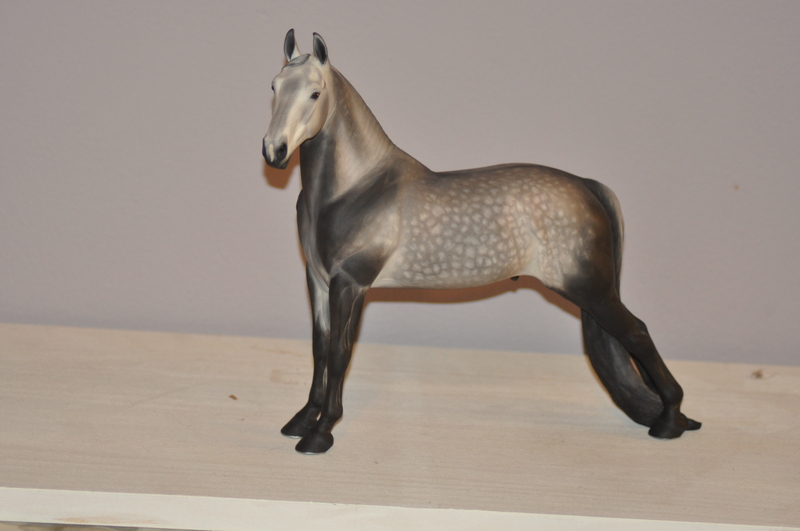 If you describe the item accurately, then it is the buyers choice (and risk) to purchase. 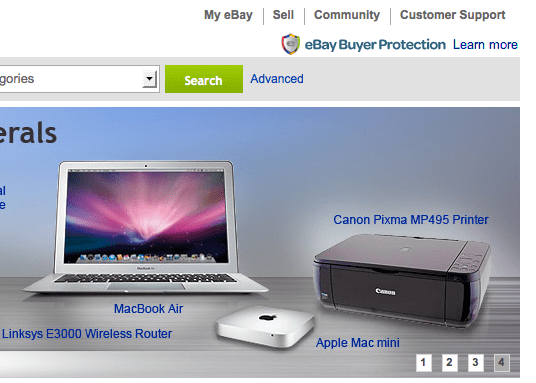 Ebay has a variety of upgrades you can add to your auction, but not essential to a successful auction. Subtitles and fancy listing designs are unnecessary if you are only using Ebay occasionally. Choose what you think you need, but remember many of the extra options add a small fee. Look over and read all of the options the first time you use Ebay so there are no surprises. After you describe your item, attach photos, and set all the important parameters, click continue. At this point, you will also see your listing fees. The next screen will confirm your choices. On this screen you will be given a variety of upgrade options again, a preview of how your listing looks in the line up, and Ebay gives some suggestions on how to improve your listing. Again, these options are totally up to you, and for the most part not needed for the casual Ebay seller. 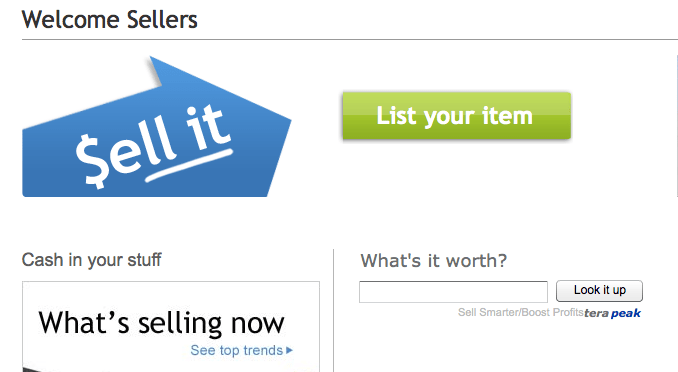 If everything looks correct then you can click “list your item”, and your listing will be live. You can edit your listing after it is live, but it should be avoided unless there is something missing or incorrect. Buyers might ask you questions about your item, and I recommend adding those questions and your response to the listing, if it is appropriate. Don’t forget to leave positive feedback if your transaction goes well. If there is any dispute, it usually is easily resolved through Ebay. Have a question? Post it in the comments!